On the evening of 20th March members of the Brigade of Gurkhas were invited to attend an event at the Embassy of Nepal, Kensington Palace Gardens, London. 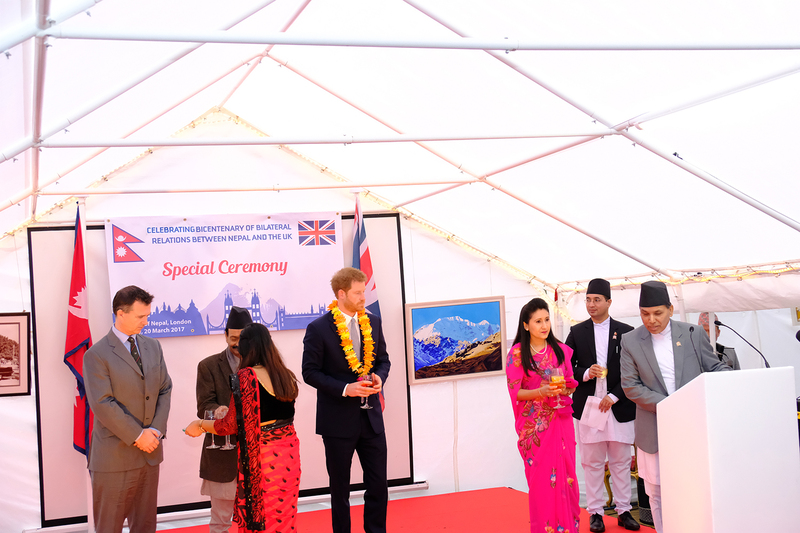 The occasion was to mark the bicentenary celebrations of the bilateral agreement between Nepal and the United Kingdom. 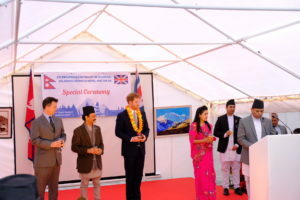 The guest of honour from the United kingdom was HRH Prince Harry. 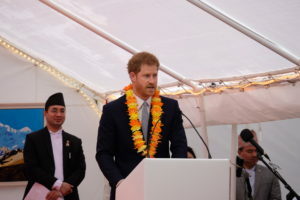 Prince Harry has been a big supporter of the Brigade of Gurkhas since his service in the British Army and the fact he served with Gurkha Officers and Soldiers in Afghanistan in 2007 and 2010. I had the pleasure of visiting Nepal exactly a year ago. I experienced first-hand the true meaning of Nepal’s slogan “I am in Nepal Now”. Last week, I joined my Father in presenting operational service medals to officers and men from 2nd Battalion of the Royal Gurkha Rifles, some of whom are with us here today. My father spoke of how important his 40 year association to the Gurkhas is to him. Even though my association hasn’t been quite as long, I also draw a great deal of pride and joy from my association with the Gurkhas. I will close by saying thank you to everyone for joining us today to celebrate our 200 year-long friendship between the United Kingdom and Nepal, and we look forward to our continued close bond of friendship for centuries to come, and now that my tika has finally faded it’s probably about time to go back! You can read his full speech on this link. He was invited to light a candle to mark the occasion and then invited inside the Embassy to unveil a painting with the details of the Victoria Cross reciprecants from the Gurkhas on. He then met various serving, ex-serving and UK based Nepalese people in the Embassy before returning outside to watch a display of traditional Nepalese dancing and the famous Khukuri Dance by members of the Brigade of Gurkhas. Among those attending from the Brigade were; the Colonel Commandant (Lieutenant General NAW Pope CBE), Colonel Brigade of Gurkhas, (Colonel James Robinson) and the Queen’s Gurkha Orderly Officers. There was also representation from across the serving Brigade and veteran community. Mark Lancaster MP was also a senior guest. He is currently the Parliamentary Under Secretary of State for Defence Personnel and Veterans. He commissioned into the Army based in Hong Kong with the Queens Gurkha Engineers. He then went on to read Business Studies at Buckingham University and completed an MBA at Exeter University, before returning to help run the family business, Kimbolton Fireworks. During this period, Mark Lancaster transferred his commission to the Territorial Army in 1990 and during 28 years military service has commanded a Royal Engineer Bomb Disposal Squadron and deployed on operational service to Kosovo, Bosnia and Afghanistan. Awarded the Territorial Decoration in 2002, Mark received his second long service medal, the VRSM in 2011 and Bar in 2016. He continues to serve as a Lieutenant Colonel in the Royal Engineers and is currently a Member of the Royal College of Defence Studies.